^ a b c Guillot, Tristan et al. (2009). 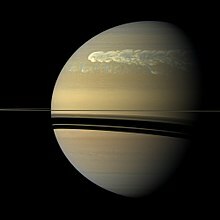 “Saturn's Exploration Beyond Cassini-Huygens”. In Dougherty, Michele K.; Esposito, Larry W.; Krimigis, Stamatios M.,. Saturn from Cassini-Huygens. Springer Science+Business Media B.V.. p. 745. arXiv:0912.2020. Bibcode 2009sfch.book..745G. doi:10.1007/978-1-4020-9217-6_23. ISBN 978-1-4020-9216-9. ^ Saumon, D.; Guillot, T. (July 2004). “Shock Compression of Deuterium and the Interiors of Jupiter and Saturn”. The Astrophysical Journal 609 (2): 1170–1180. arXiv:astro-ph/0403393. Bibcode 2004ApJ...609.1170S. doi:10.1086/421257. ^ Guillot, Tristan (1999). “Interiors of Giant Planets Inside and Outside the Solar System”. Science 286 (5437): 72–77. Bibcode 1999Sci...286...72G. doi:10.1126/science.286.5437.72. PMID 10506563. ^ Courtin, R. et al. (1967). “The Composition of Saturn's Atmosphere at Temperate Northern Latitudes from Voyager IRIS spectra”. Bulletin of the American Astronomical Society 15: 831. Bibcode 1983BAAS...15..831C. ^ Orton, Glenn S. (September 2009). “Ground-Based Observational Support for Spacecraft Exploration of the Outer Planets”. Earth, Moon, and Planets 105 (2–4): 143–152. Bibcode 2009EM&P..105..143O. doi:10.1007/s11038-009-9295-x. ^ Dougherty, Michele K.; Esposito, Larry W.; Krimigis, Stamatios M., eds (2009). “Saturn from Cassini-Huygens”. Saturn from Cassini-Huygens (Springer): 162. Bibcode 2009sfch.book.....D. doi:10.1007/978-1-4020-9217-6. ISBN 1-4020-9216-4. https://books.google.com/books?id=M56CHHxVMP4C&pg=PA162. ^ Pérez-Hoyos, S.; Sánchez-Laveg, A.; French, R. G.; J. F., Rojas (2005). “Saturn's cloud structure and temporal evolution from ten years of Hubble Space Telescope images (1994–2003)”. Icarus 176 (1): 155–174. Bibcode 2005Icar..176..155P. doi:10.1016/j.icarus.2005.01.014. ^ Godfrey, D. A. (1988). “A hexagonal feature around Saturn's North Pole”. Icarus 76 (2): 335. Bibcode 1988Icar...76..335G. doi:10.1016/0019-1035(88)90075-9. ^ Sanchez-Lavega, A.; Lecacheux, J.; Colas, F.; Laques, P. (1993). “Ground-based observations of Saturn's north polar SPOT and hexagon”. Science 260 (5106): 329–32. Bibcode 1993Sci...260..329S. doi:10.1126/science.260.5106.329. PMID 17838249. ^ Godfrey, D. A. (1990-03-09). “The Rotation Period of Saturn's Polar Hexagon”. Science 247 (4947): 1206–1208. Bibcode 1990Sci...247.1206G. doi:10.1126/science.247.4947.1206. PMID 17809277. ^ Baines, Kevin H. et al. (December 2009). 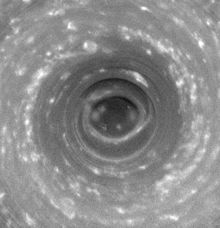 “Saturn's north polar cyclone and hexagon at depth revealed by Cassini/VIMS”. Planetary and Space Science 57 (14–15): 1671–1681. Bibcode 2009P&SS...57.1671B. doi:10.1016/j.pss.2009.06.026. ^ Gurnett, D. A. et al. (2007). “The Variable Rotation Period of the Inner Region of Saturn's Plasma Disc”. Science 316 (5823): 442–5. Bibcode 2007Sci...316..442G. doi:10.1126/science.1138562. PMID 17379775. ^ Anderson, J. D.; Schubert, G. (2007). “Saturn's gravitational field, internal rotation and interior structure”. Science 317 (5843): 1384–1387. Bibcode 2007Sci...317.1384A. doi:10.1126/science.1144835. PMID 17823351. ^ Poulet F.; Cuzzi J.N. (2002). 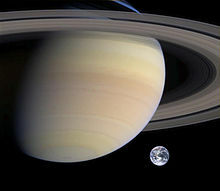 “The Composition of Saturn's Rings”. Icarus 160 (2): 350. Bibcode 2002Icar..160..350P. doi:10.1006/icar.2002.6967. ^ Spahn, F. et al. (2006). “Cassini Dust Measurements at Enceladus and Implications for the Origin of the E Ring”. Science 311 (5766): 1416–1418. Bibcode 2006Sci...311.1416S. doi:10.1126/science.1121375. PMID 16527969. ^ Nicholson, P.D. and 16 co-authors (2008). 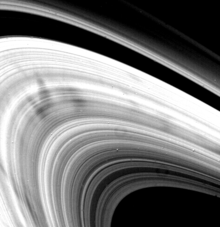 “A close look at Saturn's rings with Cassini VIMS”. Icarus 193 (1): 182-212. Bibcode 2008Icar..193..182N. doi:10.1016/j.icarus.2007.08.036. ^ Charnoz, S.; Porco, C.C. et al. (2005). “Cassini Discovers a Kinematic Spiral Ring Around Saturn” (PDF). Science 310 (5752): 1300-1304. Bibcode 2005Sci...310.1300C. doi:10.1126/science.1119387. PMID 16311328. http://ciclops.org/media/sp/2007/2672_7431_0.pdf. ^ Jones, G. H. et al. (2008-03-07). “The Dust Halo of Saturn's Largest Icy Moon, Rhea”. Science 319 (5868): 1380–1384. Bibcode 2008Sci...319.1380J. doi:10.1126/science.1151524. PMID 18323452. ^ a b Barton, Samuel G. (April 1946). “The names of the satellites”. Popular Astronomy 54: 122–130. Bibcode 1946PA.....54..122B. ^ Kuiper, Gerard P. (November 1944). “Titan: a Satellite with an Atmosphere”. Astrophysical Journal 100: 378–388. Bibcode 1944ApJ...100..378K. doi:10.1086/144679. ^ Lebreton, Jean-Pierre et al. (December 2005). “An overview of the descent and landing of the Huygens probe on Titan”. Nature 438 (7069): 758–764. Bibcode 2005Natur.438..758L. doi:10.1038/nature04347. PMID 16319826.